I did not grow up eating liver. When they set up house together, my parents made a pact to ban their dreaded childhood meal of liver (and Brussels sprouts). However, that meal involved calf or beef liver. Occasionally, when visiting either of my grandmothers, chicken liver, in the form of chopped liver, made an appearance, though, as a child, I was never tempted to try it. (I do think both my parents mother indulged though, so much for consistency in their preferences.) NOTE: My father just called to register his objection to my earlier statement. He tells me he hasn’t eaten liver in any form for well over 50 years, and doesn’t want anyone to think he has. He hates liver. I stand corrected, Dad! Surprisingly, it was Howard (he who doesn’t like so many things) who recruited me to join “Team Chopped Liver” back in our courtship days. Following in his own mother and grandmother’s footsteps, he always made chopped liver for an indulgent snack. 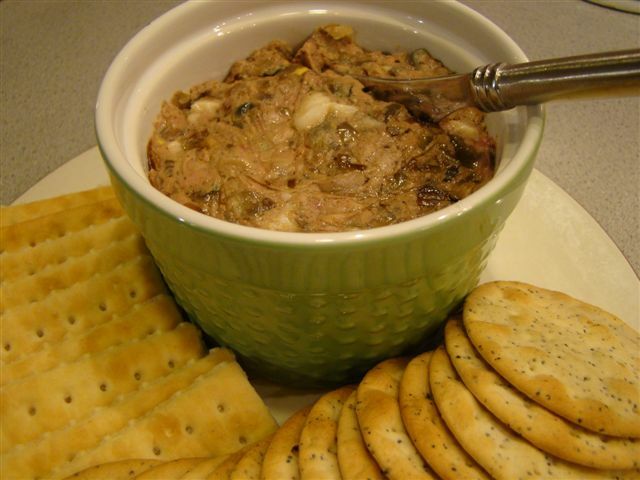 Chopped liver is hardly an everyday food. It’s must be #1 on any list of artery-clogging treats. However, I was easily convinced. When I mentioned that this week’s choice for French Fridays with Dorie was Mme. Maman’s Chopped Liver, Howard asked how it would be different from what we usually make. His version is a combination of chicken liver, fried onions, and hard boiled eggs. Actually, there isn’t much difference. On paper, there are just three small things. The first is technique. Mme. Maman cooks the onions, and then the livers, in A LOT of oil. 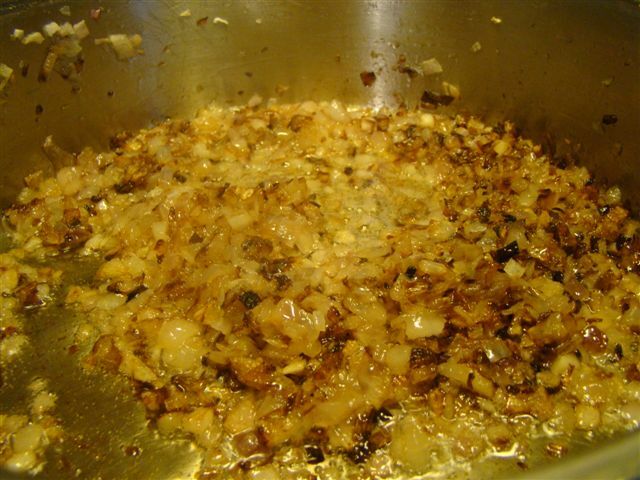 The excessive oil allows the onions to brown beautifully. The extra oil is drained off, so the final spread is not overly oily. The second difference is the addition of quatre épices, a classic French blend of four spices: white pepper, ginger, nutmeg, and cloves. I mixed my own based on this recipe from Gourmet. The final difference is texture. The liver is coarsely chopped by hand (Howard usually purees the liver in the food processor), so the end result is chunkier than the smooth spread we are used to. I served the chopped liver (in the new soufflé dishes I bought for another recent recipe) with water crackers and Club crackers. I preferred the flaky, buttery Club crackers. Ritz crackers would also be a good choice, but I didn’t have any of those in my magic pantry. The verdict at my house was three thumbs up. Or maybe I should say two thumbs (Howard’s and mine) and one dewclaw (Bella’s). The whole family was enthusiastic. I found no need to add any of the extra oil drained off after cooking. The perfect alternative was storing it in a jar and adding a spoonful to Bella’s twice daily bowls of kibble. She’s an extremely finicky eater, but she’s finished every meal this week. Howard even caught her licking the bowl. I think my enthusiasm puts me in the minority this week. According to the P&Q discussion, many of my Dorista friends are seriously liver-challenged. They were getting creative about faux liver substitutions. To check out their final results, faux or vrai, follow their links here. I highly recommend the vrai version. We don’t post the recipes, but you can find it in Dorie Greenspan’s book Around My French Table.